Sorry, we are currently sold out of 'Genuine Chinese Turquoise Chips - Long 32-in strand'. Please check back later. Price is per long 32-inch strand of these beautiful genuine Chinese turquoise chip beads - ready for stringing. Chips average 7mm. These beautiful hearts are made from constituted Chinese turquoise (almost like the real thing, but much cheaper!). Each heart measure 8mm. Chinese Turquoise is a soft, opaque gemstone. Ranging from blue-green, to yellow-green with grey, black or brown veining . Much Chinese turquoise was used for artistic carving and jewelry, which has always been popular in the Orient. In China, Turquoise dates to the thirteenth century A.D. Although most brought from trade with the Persians, Turks, Tibetans, and the Mongols. Tibet had it's own source of turquoise usually a green cast, very hard stone with significant amount of spider webbing. The Tibetans highly revered turquoise and was used in many areas as currency. Ancient doctors thought turquoise prevented injury through accident, and would place perfect stones over the eyes to prevent blindness. They also ground it into a powder to cure stomach disorders, internal bleeding, ailments of the hip and bites and stings. Turquoise is believed to protect the wearer from danger. In various countries, it is believed to fade when illness or danger is near. Another belief is that a fading stone indicates a lover's faithlessness or a friend's disaffection. Turquoise is porous, so contact with liquids, oils or even perspiration should be avoided. Jewelry should be removed before washing. Turquoise is commonly impregnated with plastic, colorless oil or wax to improve color and increase durability. Untreated turquoise will eventually turn green. 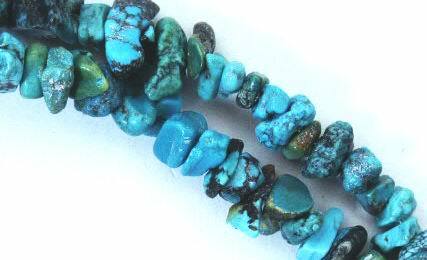 As genuine Chinese turquoise is expensive, reconstituted turquoise is made today. Crafted from real turquoise chips fused with other stones to cut the cost. Turquoise is the birthstone for the month of December.